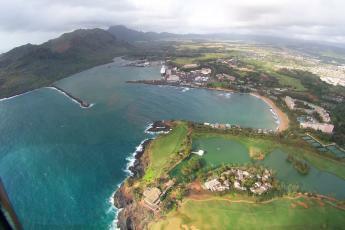 On the island of Kauai, their is a movement to celebrate ancient sites. Land once used for agriculture and other purposes is being restored. Native Hawaiian cultural sites are being brought back to life on the island. Many are pitching in on the effort. Chris Kauwe, a resident of Poipu, is one of the volunteers. For the last four years, he and others have been working on land once owned by the county in Weliweli. This land is being restore as the ancient village it once was. The land at Weliweli had been forgotten by everyone. It wasn’t until Kauwe referred to an archaelogical map that he realized the site existed–and he lived right next door! Another of the volunteers is Billy Kaohelaulii. His family was given the land in the 1800s. But, the land was taken away and then ended up as part of county property. He feels a connection to the property and wants to see it preserved. Joining Kauwe and Kaohelaulii are neighbors and friends. The work has been progressing. They spend a few days a week on the project. It has taken awhile just to clear the land of the debris that had been left by others. Now they can see what was once there and work towards it’s preservation. Kauwe and Kaohelaulii are working to restore just this site. However, many projects have sprung up Kauai as well as throughout the state. These sites are important to the history of the Hawaiian islands. For the culture to survive, ancient sites need to be restored so others may enjoy them. Also, the histories, stories, and purposes of the sites need to be passed on so that the future generations will have an understanding of their heritage.